In mountainous regions, the patches of level land are given romantic names like dells, glens and dales, but this little one up in Warriors Mark West is called Amber Ridge. Amber might refer to its look when the sun glances across it in the morning and evening. Ridge, in its name, rightly advertises an unobstructed view, but precipitous these lots are not. Amber Ridge lies on a flat loop road off White Cloud Drive, and consists of four pairs of duplex homes, and seven single-family residences, all in a lightly forested park. A snow capped Peak 10 is so prominent on the western horizon from Amber Ridge, it dwarfs even the most spectacular full moon ever rising in the east. Read more about this small, desirable subdivision, or check out the available Amber Ridge homes below! Amber Ridge homes for sale come from a mixture of 15 residences, broken down as six duplexes and seven single family homes. Another group of two attached homes is called, by the county, Amber Ridge Condos. It's statistics are recorded separately but it is in the same vicinity. Amber Ridge was first established in 1980. It is a short drive to the town of Breckenridge from West Warriors Mark. Countywide shuttle buses serve lower Warriors Mark, and it is possible to ski home to the neighborhood from the runs on Peak 10. 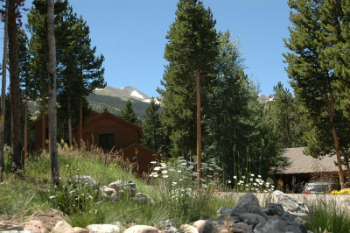 Amber Ridge is within the town of Breckenridge, unlike its neighbors farther south in ‘unincorporated Summit County’. This distinction means homes for sale are subject to a transfer tax, but residents can vote in city elections, and pay lower-priced utilities and rec-center membership fees. The land around these homes is forested, and an open park for all residents. There is common parking, but most homes have private garages, as well. Two of the homes were build in the nineteen nineties, and technically, make up another subdivision called Amber Ridge Condos, but are similar in style. From this ridge, it’s downhill to the lifts at the base of Peak 9 and residents will show how easy it is to ski there, by strapping on their skis across the road and heading along a trail off the ridge. Likewise, these skiers come home from Peak 9 through the forest and glide up as far as possible before having to skate the final strokes home. It’s not for beginners, but an acquired access, or a ski-in/ski-out adventure. Cross-country skiing from the doorstep is truly easy, and trails radiate in several directions. Homes for sale in Amber Ridge will be near the free shuttle stop, which is at the bottom of White Cloud Road. 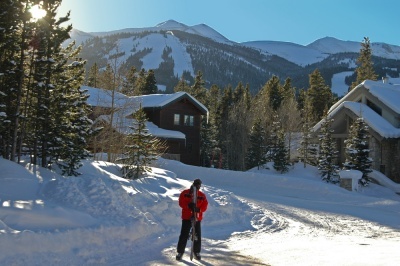 By shuttle or car, downtown Breckenridge is a quick trip. Size: 2022 to 5234 sq. ft.
Amber Ridge subdivision is located high in Warriors Mark West on a knoll between the final switchback on White Cloud Drive on a street called Amber Court. From here, homes overlooks Peak 10 and the ski area, or lower Warriors Mark to the east and Baldy Mountain. Are you ready to talk about the real estate opportunities in Amber Ridge, or any other Breckenridge subdivision? Contact us now!